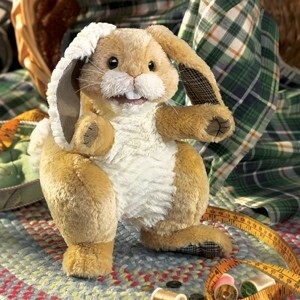 Folkmanis 2947 - This homespun PATCHWORK RABBIT is as scrappy as they come. With lots of personality and differently textured and patterned fabrics like a vintage quilt, this rabbit is great for snuggling, storytelling or bringing homey comfort on a long trip. Measures 11" x 7" x 12". Movable mouth and forelegs.